Leaves are changing, the weather is getting colder, and I can’t help but think of how GoMacro started. Many know part of the GoMacro story about how I made cookies after being diagnosed with breast cancer. However, it didn’t start with only cookies. At the time, Jola and I weren’t sure of what we would sell, so I made a variety of cookies, bars and pies. Of course, the bars took off much quicker than the other two. Initially, my idea behind the pies was that I would use all the fruit that I was growing on the farm including plums, apples, pears, raspberries and strawberries. Now that I think about it, most of these pies were actually tarts, but still pie-like. So, I had a plum tart, raspberry tart, raspberry chocolate tart, deep-dish apple pie, and my most famous, the pear ginger tart. I would bake and deliver them myself to the local stores. Only a few local stores purchased them, which meant that our sales of the pies were short-lived to one Fall in 2004. The reality of the difficulties that came with selling pies, caused Jola and I to change directions to the MacroBars, but I still think about the MacroPies and make them in my own kitchen. 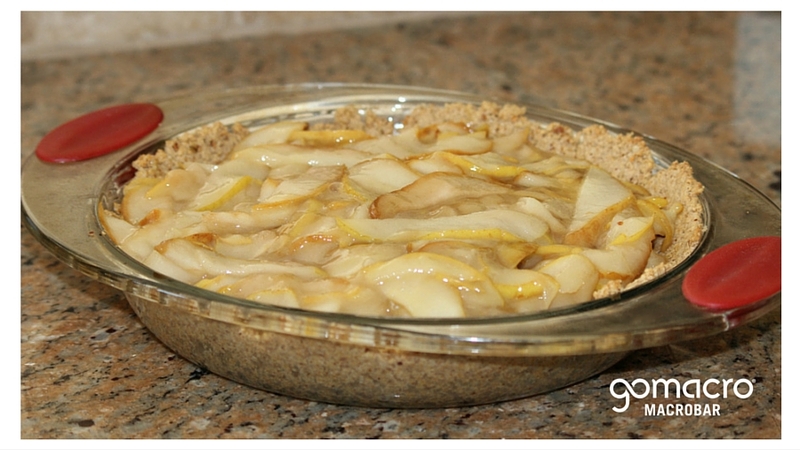 With the start of Fall 2015, I want to commemorate the MacroPies to our wonderful family of GoMacro fans with my Pear Ginger recipe. I hope you enjoy this family fall tradition as much as we do in our family. 1. To Make the Crust: Preheat the oven to 350 degrees. Oil a 9.5” tart pan. Toast almonds and rolled oats and grind in a processor. In another bowl, combine walnut oil, ¼ cup maple syrup and vanilla extract then mix with dry ingredients. The mixture should be crumbly. Press into tart pan. To ensure the mix doesn’t stick to your hands, use a piece of saran wrap to help press the crust into place. Bake for 12 minutes. 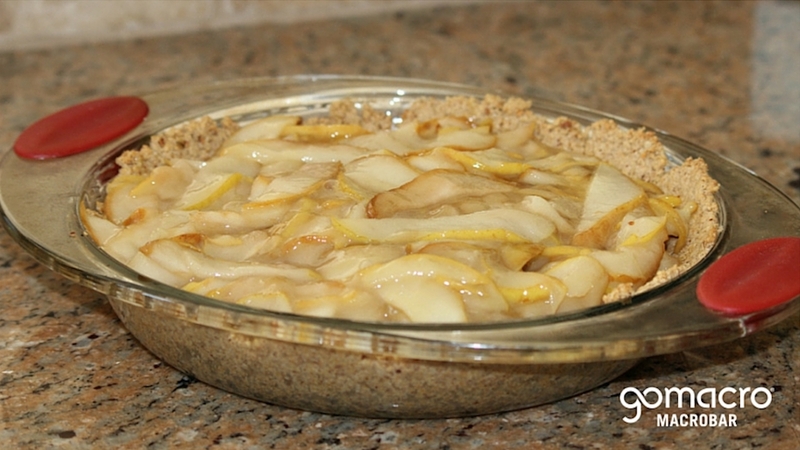 Once finished, add the pear mixture to the crust and refrigerate until the filling is set. 2. To Make the Filling: Thinly slice the pears and toss with lemon juice. Cook for about 10 minutes on the stove with ½ cup of maple syrup until softened. Combine arrowroot and fresh ginger in a small bowl with the liquid from the pear/maple syrup mixture and stir until smooth. Add the mixture back to the pears and stir immediately. It will start to thicken as soon as it gets close to a boil. Once you see it thicken, turn off the stove and continue mixing for about a minute.